Enjoy the last happy chapter before We Know happens. New Year’s, yay! Here are chapters 1 2 3 4 5 6 7 8 9 10 11 12 13 14 15 16 17 BONUS 18 19 20 !!! “Five minutes until 2019!” John exclaims. “Everyone have their new year’s resolution?” They’re all at Times Square to watch the ball drop. “Dude, you’ve been thinking for the last hour, and you still have nothing,” Hercules points out. “I know, I know. You know how bad I am at these. Hm… Hey, I got it now!” he exclaims. “That’s the fifth time you’ve said that,” Alex says. “I feel like I’ve known you guys my whole life,” Alex remarks. “We’ve done this two or three years in a row,” Laff points out. “I know, I know. But it’s still really cool! We actually get to see the ball drop! Oh, and what if we get on TV?” John asks excitedly. “John, chill,” Alex says with a laugh. It’s time for the countdown. “Ten! Nine! Eight! Seven! Six! Five! Four! Three! Two! One! HAPPY NEW YEAR!! !” everyone in the crowd shouts. Hercules pulls Lafayette into a kiss, and John whoops. “Alright alright!” he shouts. “This is going to be a great year!” Alexander exclaims. Will it, Alex? Will it? They make their way through the crowd, and after twenty minutes, finally get to the car and climb in. They rented a bigger car for the night so that they can all fit without anyone getting squished. There are two seats next to eat other in the middle, leaving an open space on the left for people to climb into to get to the seats in the back. Laff and Herc sit in the middle, and John and Alex climb into the back. Not ten minutes later, Herc is already asleep on Laff’s shoulder, and Lafayette is resting his head on top of his boyfriend’s. “They’re so cute together,” John whispers. Alex nods and takes out his phone, taking a picture of the two of them. John yawns and leans his head against the seat. “G’night,” he murmurs, closing his eyes. Alex stays awake, watching people go by and willing the cars in front of them to go faster. After a few minutes, he feels a weight on his shoulder and sees that John’s head is on his shoulder. He smiles slightly and adjusts himself to make it more comfortable for John. Alex watches him peacefully sleep, his beautiful eyes closed and his freckles more apparent than ever. And in that moment, he realizes how perfect and innocent he is, and he vows to protect him. He ends up falling asleep, his head resting on John’s. John is the first to wake up, and it’s when they still have about ten more minutes until they get home. He then realises his position. He’s about to move when he realises it would wake up Alex. Besides, sleep is trying to pull him under. So he just snuggles closer to Alex and falls back asleep. Herc and Laff wake up at the same time when they get to Herc’s house. Lafayette nudges Hercules and points to their other friends. “I’m going to take a picture,” he whispers quietly. He pulls out his phone and takes a picture of the two of them peacefully sleeping. Herc then nudges Alexander’s leg and says gently, “Hey, Alex, time to get up.” He stirs and opens one eye. He yawns and nudges John. “John. Hey, John. Time to get up.” John groans and opens his eyes. He then stretches and sits up. They all unbuckle and head inside. They all grab their pajamas and change before heading toward the pile of blankets and pillows where they will be sleeping. John hardly pulls the blankets over himself before he’s asleep. Laff nudges Alex and whispers, “Look at you two.” He shows him the picture of the two of them sleeping in the backseat. Alex climbs under the blankets, and he falls asleep within minutes. It’s ten o’clock when John wakes up. Still drowsy, he opens one eye to see Alex watching him silently. Then he notices that they’re only a few inches apart. He must have turned over in his sleep and somehow moved closer to him. “Well good morning,” John groans, his eyelids feeling heavy. “Maybe I did, maybe I didn’t,” Alex replies. John bites his lip and begins to blush. He rolls over so that Alex doesn’t see, but he just finds Laff laying on his back, looking at the ceiling. He glances at John and, seeing his blush, raises his eyebrows. John decides that he’ll just put his head in the pillow. John turns his head so that one eye is looking at Laff. “Of course I do,” he states. “Because this is your house, and I don’t want to go alone,” Laff answers. “Fine.” They get up and leave within ten minutes. John just lays there, his face still in the pillow, not wanting to get up. “What?” John replies, lifting his head up slightly. He opens his mouth to say something, but then shuts it again. “Never mind,” he says, not meeting his friend’s eyes. Marie-Joseph Paul Yves Roch Gilbert de Motier Lafayette you are in so much trouble when you get back, John thinks. “No, it’s alright. Tell me,” he encourages. “Just… never mind. It’s nothing,” Alex says, turning away. They come back in about twenty minutes with the donuts. John is still laying down, and Alex is flipping through channels on the TV. John would say something to Laff, but he has doughnuts. And he wants doughnuts. “We got donuts!” Laff announces. John sits bolt upright and stands up quickly. Too quick. His vision goes blurry and he gets dizzy, which is what happens when you stand up too fast. It’s honestly the worst. Once they’re done eating, they all go to John’s house to help Alex pack. It’s time for him to stay at Herc’s house, where he will stay until April. “Mon ami, you’ve had a week to pack. Why is nothing packed yet?” Lafayette scolds, going into Momayette mode. “I wanted to hang out, not pack!” Alex explains, shoving clothes into his suitcase, covering his special box. “Well now you have to pack, so ha!” Laff retorts. “At least you guys are helping me,” Alex shoots back. After fifteen more minutes, they’re done, and they help Alex bring the stuff over to Herc’s house. He then spends the rest of the day unpacking. School has come back. Despite not wanting it to, it came back. And on the first day back, Mr. Washington gives them an assignment. Alex thinks Please don’t put me with Jefferson, please don’t put me with Jefferson, PLEASE DON’T PUT ME WITH JEFFERSON! Okay, decent people, Herc thinks. I just hope Eliza and Maria don’t argue. NOT CHARLES!!! At least Peggy is nice, And Jasmine… waIT JASMINE! John thinks. Oh no. Oh nonononononono. Jasmine? Frick. Frcikfrickfrickfrick. NNNNNOOOOOO!!!!! Lafayette thinks, not wanting to be with either of these people. Alex feels bad for him, but it would be more disastrous if he got Jefferson. Ew, Jefferson’s little friend. And who the heck is John Jay? Alex thinks. Mr. Washington calls out a few more groups, and then they get into their groups. Alex joins up with James Madison and a short boy with ash blonde hair and grey eyes, which he assumes is John Jay. “So, what do you guys want to do?” Alexander asks, breaking the silence. “Um, maybe the Constitution and the Federalist Papers?” Jay suggests. “I like that idea,” Madison remarks. “Me too. Okay, so maybe we can do twenty five different slides, divided evenly among us?” Hamilton suggests. While Alex is dealing with a pretty chill group, Lafayette is suffering under the wrath of Jefferson and Burr. But it’s a very… interesting argument. “Believe me, I look way better than you,” Jefferson insists. “Guys, you look exactly the same!” Burr argues. “Well, I can pull off a bun better than you,” Lafayette replies, ignoring Aaron. “Guys, you look exactly the same. You want proof? Look at the Holly incident!” he exclaims. Laff shuts up right away, not wanting to go down that road. “Let’s just do the assignment,” he says. They get to work, snide remarks thrown here and there. “No,” Maria says. “Besides, there is another reason I hate her.” She thinks back to when she started dating Alexander, and she had a crush on him. But little does Eliza know, she got her revenge. And she will probably never know. “And what might that be?” Eliza challenges. “Girls! Work!” Hercules shouts. They send glares at one another, but finally get to work. John is about to burst. “I freaking swear Lee if you say one more thing like that to Peggy, you’ll be looking at her through a black eye and three missing teeth,” he threatens. “I can flirt with her if I want, Laurens! You can’t stop me,” Charles says defiantly, crossing his arms. He winks and replies, “Not yet at least. But I can flirt with Jasmine.” He winks at her. She’s a cute girl with short brown hair and grey-blue eyes. She has a few scattered freckles across her nose and cheeks, and she’s the kind of girl that never wears makeup. She is wearing black turtleneck with a grey scarf, jeans, and boots. “Don’t you dare!” John growls, his voice rising, and his face beginning to turn pink. From anger or embarrassment, it’s hard to tell. “Yeah, I have a boyfriend,” she says in her soft voice. “Oh come on, can’t I have one of your two lovely ladies? I can guarantee that I’m the best kisser at this school,” he says, trying to be seductive. Peggy has to hold John back so that Lee isn’t beaten to a pulp. Charles laughs. “Oh, does your girlfriend have to hold you back?” he taunts. That’s how Peggy ends up in the principal’s office, not a scratch on her. But… the same can’t be said for Lee. He has a black eyes, a bleeding lip, a cut on his cheek, and his nose is bleeding, possible broken again. “Young lady, what made you do this?” Principal Frederick asks, his hands crossed in front of him. “He provoked me. The jerk got what he deserved,” she says definitely, not caring if she gets suspended. When she walks out of the principal’s office, John is waiting for her. “Hey, you really didn’t have to do that, Peggy,” he says, following her down the hall. “For not trying to stop me.” They both laugh and head to their next classes. Alex has been typing furiously on his computer, working on his history project. He’s already gone past the eight he needed to do, and it appears Madison has done the same, too. Jay has only worked on two of them. “Alex, you need to take a break,” Herc says, leaning in his doorframe. “But there’s so much to say!” Alex argues, still typing. “Mhmm,” Alex replies, only half listening. Herc sighs and leaves. Alexander’s birthday is on January 11th, which is on Friday. Today is Monday, and his friends are going shopping for gifts. Alex just types away while his friends search high and low for the perfect gifts that he didn’t get at Christmas. And let’s just say, it’s hard. But they manage. He shrugs. “I type fast. And I found there was a lot to say.” James shakes his head slowly and walks away to join Jefferson. It’s Thursday, and Alex can’t wait until his birthday. He’ll finally be fifteen years old! It seems like a magical number for some reason. Today, they have to present their slideshows. And if I said Mr. Washington was amazed with the number of slides (85; 5 were Jay, 29 were Madison, and Hamilton wrote the other 51), that would be an understatement. The whole class was beyond amazement, and they were certain to get an A+. Alex walked back to his seat, satisfied and full of pride. Herc, John, and Laff were able to manage with their groups, but nobody did as good as Alexander’s group. And during this project, Lafayette has maybe or maybe not kind of become friends with Jefferson, but that’s just when he’s alone with him. When Laff is with his friends, Thomas goes back to being a jerk. But otherwise, they’re on okay terms. Confused, John gets up and follows her a ways away. “Okay, I need your opinion on something,” she says quietly. “My opinion? Really? Hm, what is it?” John asks. John smiles. “Yeah, he’ll love that,” he says quietly. “Thanks John! I owe you one!” She then skips off to her friends. John walks back and is immediately pestered with questions. “Alright, what did she want?” Alex asks skeptically. “Oh whatever,” he replies, pouting. Later that day, it’s 11:58, and Hercules is letting Laff and John into the house. Hopefully, they are able to scare Alex. “And who was it about?” Laff asks, his eyebrows raised. Alexander’s face turns a red deeper than Maria’s lipstick, which is really saying something. “No one!” he replies, his voice going up two octaves. “Present time!” John exclaims, emptying the bag of presents onto the edge of his bed. Alex eyes them before picking a green and silver gift. 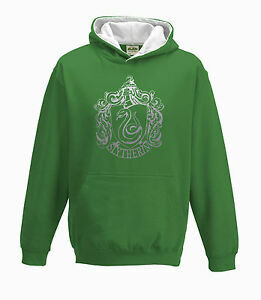 He rips off the paper to find a Slytherin hoodie. It is a well known fact that he is a Slytherin, and he’s proud of it, too. “I knew you’d love it!” John says. “What? No, you’re not! Herc, get a book,” John says, not wanting it to be true. They stand back to back, and find that the book is slanted, showing that Alexander is taller. “Well, I might grow taller!” John argues. Alex says his thank you for the hundredth time before Laff and John head home. He falls asleep, already at a good start of his birthday. He wakes up to someone knocking on his bedroom door. He sits up and says, “Come in.” Hercules opens the door to reveal James. Alexander’s face spreads into a huge smile, and he runs up to his brother, giving him a big hug. “Hey Alex. Happy fifteenth birthday! I got you something.” He holds out a beautifully wrapped gift. Alex takes it and opens it to find papers bound by string. He opens it to find page upon page of “Time With Your Brother” coupons. There are things like “Go to Starbucks”, “Have dinner”, and other things like that. “Since I haven’t seen you in so long, I thought this would be a great way to catch up,” James explains. “Alright!” he replies. James then leaves. Alex gets ready, slipping on his new hoodie. He eats breakfast and has a cup of coffee before heading to school. During lunch, Eliza comes up to him and exclaims, “Happy birthday! I got you something.” She hands him a small silver present that’s about six inches by four inches and two inches high. Curious, he opens it to find a leather bound group of papers, with the title ‘365 Reasons Why I Love You’ on the cover. “Oh my gosh, Eliza, did you make this?” Alex asks with awe, opening it up to a random page. “I did,” she replies, trying to hide her pride. That night, they have the best New York pizza for dinner and birthday cake. Overall, it has been a wonderful birthday, and a wonderful new year (even though it’s only been eleven days). Life is perfect. If only it could stay that way.